RMIT University's electric-powered Formula SAE racer powered down the Albert Park track at 12.15pm today, in a showcase of green racing. The racer won the electric event at the Society of Australasia FSAE Championship held in Werribee late last year, lapping faster than many internal combustion cars. 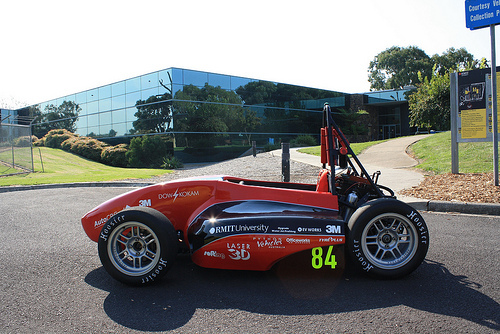 The electric-powered, sustainable, open-wheeler race car is designed, manufactured, assembled, tested and raced by a team of RMIT students. The RMIT Electric Racing team includes more than 30 students from engineering programs in aerospace, automotive, electrical, mechanical and manufacturing. Tyres/Brakes/Wheels: Hoosier Tyres (10x6 front, 10x7 rear), custom made RMIT aluminium wheels, all round outboard disc brakes, 4 pot Wilwood callipers.